So important it can alter how you interpret the messages that you take in every moment of every day. The messages we have received over the course of our life impact how we see ourselves, our motives for doing and being, our behavior and how we view others. What do the signs say? Maybe the messages you have received most of your life have been positive. Your perspective on life is one of hope and eager anticipation of what comes next. Perhaps though, the messages you have received have been mainly negative. They have left you feeling less than worthy, less than enough, less than important. Your perspective on life may be characterized by pessimism, doubt and uncertainty about the future. For you, the signs say, “You don’t matter. Give up.” Read across instead of each sign individually. One of the ways of changing your outlook on life is to consciously choose a different perspective. Even if it feels unnatural, you can alter the way you think about an event or something you see and your perspective on it can change. Sometimes it is all about creating a new habit that looks for the best, gives the benefit of the doubt or chooses joy. There may also be days when the right perspective is the first one evoked by your emotion. Becoming aware of your perspectives allows you to adapt them as needed to see things from another’s point of view – a skill that could be useful in our controversy-charged society. The following is the text from an email I sent out to the Family Enrichment Prayer Team I have at church. It’s a group of people who have committed themselves to praying for the young families at church and be intentional about lifting up the classes and events we offer for families. Things seems to be settling into a good groove with our latest family enrichment initiatives. Why is what we’re doing in the family ministry so important? Most churches have bible classes for kids, so what makes ministering to families different? to show a child what the good life in Christ looks like. You heard that right, even above a church, a family has greater potential to impart a lasting, vibrant and maturing faith. George Barna has done one research study after another about how church programs and Sunday services do not leave as deep an impact as a home with spiritual formation as it’s focus. So what does this mean for us? It means in order for us to have the greatest impact possible, we have to be reaching and equipping the parents. We cannot assume that because parents are bringing kids to church that there is faith formation happening in the home. Unless we are training parents how to connect what happens at church with what happens in the home, we leave a greater chance that our efforts, 1 hour each week, will not be maximized towards lifelong discipleship. So keep on praying for our families. Take one to lunch. Find out what their lives are like and ask what they really need. Help them navigate living out their faith amid busy schedules and competing voices telling them what’s truly important. Thank you for your investment in our families. It IS making an eternal impact! This morning in Bible class, a little boy needed a bandaid. Something simple to fix with just a quick trip to the first aid kit. But something more than healing an owie occurred. He was hurt and in his hurt he needed help. He needed to know he was going to be taken care of. He needed to know that the pain was not going to last forever. While his grief was not over anything major like the loss of a pet or loved one, the root of those feelings are the same. Grief. Deep sorrow over an owie cannot be compared with the lasting pain of losing a parent or sibling but how we address them are the same. Reassurance. Care. Presence. These cost us nothing but go a long way towards helping children walk through a process of finding healing from their wounds – both emotional and physical. Do I have to answer these questions? As I read this week’s chapter, I was somewhat dreading the questions at the end of the chapter. I knew they would require a raw authenticity that is uncomfortable. In looking at the parenting style overviews from this chapter, I see myself (dys)functioning to varying degrees in each one – in different ways. Michelle Anthony provides a glimpse into the next six chapters with an overview of each dysfunctional parenting style. Included are quotes you might hear from someone that parents with that particular style. Her frank assessment of each style might leave you feeling as if it were a bit harsh but the conclusions she draws about how a child raised that way could end up are not too difficult to agree with. If you have been keeping up with the readings each week, I encourage you to chime in with your answers in the comment section below. It’s not too late to go back and complete week 1 and if you need an overview of what this book club is all about, click here! Which dysfunction best describes how you were parented? How has that dysfunction shaped the person and parent you are today? What potential flaws in your character or in the way you interact with others need healing from this dysfunction? In what ways has God redeemed that dysfunction? In what ways can He use its manifestations in your life for good? What dysfunctions do you see yourself repeating in your role as a parent? In what ways are you compensating for your parents’ dysfunction by swinging the pendulum the other way? How will you submit these things to God, your Father, today? Anthony, Michelle (2015-01-01). 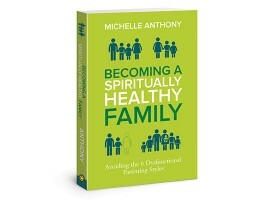 Becoming a Spiritually Healthy Family: Avoiding the 6 Dysfunctional Parenting Styles (pp. 31-32). David C. Cook. Kindle Edition. This question and number 5 might be the most difficult ones to answer. The good news in response to this question is that I have watched as God has been redeeming my parents’ parenting styles and I know they recognize some of the dysfunction in how they raised me. That being said, I was parented with a combination of the “Criticizing” and the “Absentee” parenting styles. Neither one neatly describes either of my parents but there was a fair amount of criticism as well as times when I wish my parents were more present. Thank goodness that my parents know a God that doesn’t give up on them and have allowed Him to continue working in their life to redeem and reconcile. The way these flaws have shown up in my own life are through approval seeking. I think I reacted as a young child through a need to gain approval by “being good.” I was motivated by knowing I had acted rightly and would be praised for doing a good job. I see this in my own parenting in that I want to be (and be seen as) a good dad. I get approval when I feel I am doing a good job as a father. The approval seeking shows up in my ability to overwork. My tendency to escape into my tasks (absenteeism) and to look on what others are doing, especially my children, and place expectations (criticizing) that are too high are the two main flaws which need healing. When I get into my “critical mode” I feel a deep conviction over how I may be crushing the spirits of my little girls. He calls into check just how important it is that things be done my way. When I get so involved in my work that family time suffers, he calls me back to center (sometimes not so gently) and gives me the chance to refocus on what is lasting. As Michelle Anthony describes in the chapter, grown children can adopt the style of their parenting or they can reject it and choose it’s opposite. I do find myself having both of these tendencies at times. Again, I don’t feel that I fall neatly into one category. As she quoted parents from each of these dysfunction genres, sadly, I heard my voice. The pendulum does swing back the opposite way though and I feel this is God’s way of bringing balance to my life as as way of redeeming things. When I respond without criticism or press into my family instead of withdrawing from them, he is redeeming these qualities. I think the act of submitting these to Father happens with every decision. I have to ask him to catch me quickly when I fall back into these traps. When I’m not in the moment, my prayer is that he would prepare my heart to reject those dysfunctional parenting styles and when I’m in the moment, criticizing or being tempted to withdraw, to remind me that he has something better planned. This is where the decision to surrender is both most difficult and most rewarding. So, anyone else want to take a risk? How would you answer these questions in response to Chapter Two from Becoming a Spiritually Healthy Family? There are bookshelves full of resources claiming to help people achieve the abundant life. Our first week’s reading of Becoming a Spiritually Healthy Family, bursts the bubble that claims that we can do anything to attain it. If you want your family to have an “abundant life” you must purse Jesus first. Pursuit of him leads to abundant life while pursuit of abundant life leads to dysfunction. My take away from this week’s reading is that pursuing abundant life leads to dysfunction because my view of what abundant life is gets skewed in so many ways it neglects the bigger picture that only God knows. As I begin to see my life as a part of His story, and begin living according to the script that God has written, His abundant life will become attainable because it is a bi-product of following Jesus. Take assessment of your life and the lives of your family members right now. In what areas have you coveted another’s script? In what ways have you attempted to play the role of Director in your own life? Rate yourself today on a scale from 1 to 5 (1 – “ceased to live” or “dysfunctional living and 5 – “living the abundant life”). What factors have contributed to this number? What is most difficult for you in the process of “staying on script”? What do you want or need to say to a God who continues to accomplish His plans despite your childish demands? Where does your family need an intervention from God right now? When I look back at my own life events, I have “coveted another’s script” any time I feel like I’ve been dealt a bad hand. I’m currently the only full-time staff member at our church and when I was hired, this was not what I envisioned. To be honest, there’s been a temptation to bail out of a difficult situation to try and pursue a “more abundant life” elsewhere – taking on the Director role of my own life. As my wife and I look at how our life’s circumstances have been orchestrated though, seasons of difficulty have always brought us into greater clarity of God’s purpose. Being faithful to him – allowing Him to be the Director – has always paid off. 4 – There still remains a need for me to release the areas where I want to maintain control. I really do feel that I am, for the most part, living out a life that pursues God as first in charge of my life but the tendency remains for me to try and manipulate things to go my way. The most difficult thing for me in the process of “staying on script” is believing that my part is important enough. I really second-guess sometimes whether what I am doing makes a difference or is just something I enjoy. Trying to follow his lead and direction for my life is difficult when seeing how it is impacting the Kingdom is not easily visible. (This is a tough question to answer publicly!) They need their dad/husband to lead. I am a leader and set the spiritual climate in my own home. Sometimes I convince myself that because my life, in general, is characterized by service in the Kingdom that the spiritual climate in my home will experience the blessings of this. In reality, my actual spiritually formative emphasis at home lacks enthusiasm. It’s there but it could take shape much more creatively and energetically than it is currently does. Again, I invite you to respond in the comments below with your own answers! Thanks for sharing! You are reading his blog. Josh Kellar Counseling on FB!